Todays ‘Deal of the Day’ is a big-ticket item, an Engine, complete, test run with new logs. 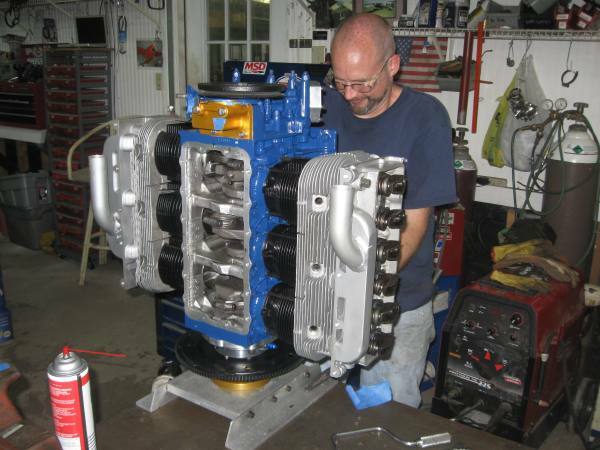 The engine is a 2700 cc Corvair Bored .030″ It has a Gen 2 Dan Weseman bearing on it, complete with a matching fully prepped GM crank from the Them. The pistons are some of the last Made in the USA Sealed power forged units (they have since been outsourced to India). The Cylinders were done by Clarks. It has stainless valves with exhaust rotators, welded on head pipes, and out latest starter and oil systems. It has our E/P dual ignition set up. It is equipped with a flyweight, welded aluminum pan. It also has one of our CNC high volume oil pumps. 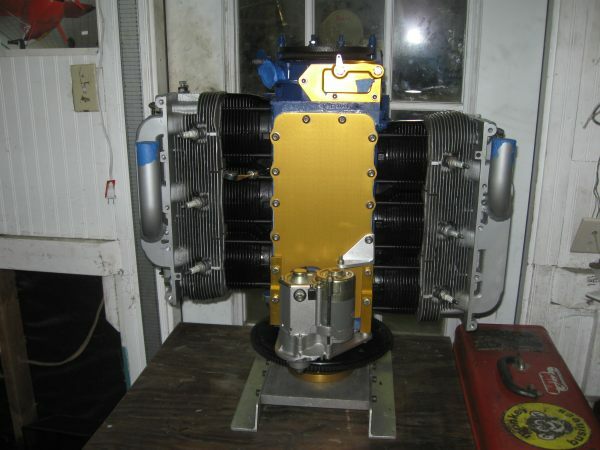 The engine is rated at 100hp continuous output, it weighs 225 pounds, (the same as an O-200) Based on the experience of building Corvair flight engines for 24 years, I can state that this engine has a realistic TBO of 1,500 hours. Two features that this engine has are a Weseman Rear alternator set up and one of our heavy-duty oil systems Our standard price for a 2700cc engine with a Gen 1 Dan bearing, front alternator and a standard 12 plate oil cooler is $9,750. The options on this engine add about $1,400 to the cost. We assembled the engine with the idea that it would be a good match to any of the popular Corvair powered airframes, but these two options are popular on STOL aircraft like the Zenith 750. The Deal of the Day: We are offering this engine with options for the standard price of $9,750 for this week alone. After this, I will bring the engine to the Zenith open house, use it as the display and then sell it for the regular price + options. This is a substantial savings for anyone who is ready to move forward. If the buyer lives anywhere near the course we are taking to CC#26 and the Zenith open house, we will deliver it for free. Otherwise, crating and shipping is available. Above shows the engine assembled, but the rear alternator, E/P distributor and HD oil system is not yet mounted. We typically put these in place when the engine is on the break in stand. The break in run for this engine is Tuesday afternoon. more pictures to follow. In more than 20 years of commercial engine building, I have only let a single engine out the door without a documented break in run. Our typical engine run is more than an hour turning a prop at 75% power. This is not only a proper break in procedure, it also assures the buyer that everything is in perfect working order. There are pictures of more than 100 engine runs done over the years on our two websites. Above, My friend, A&P extraordinaire Chris Welsh assists with the rocker adjustment. Chris’s day job is an airframe specialist for Northrop-Grumman working on E2D’s and F-5s. 25 years ago, he was my roommate at Embry Riddle. He worked for many years as an instructor at the prestigious Embry Riddle engine Repair station on the Universities’ fleet of aircraft engines. He has covered a lot of jobs in aviation, including instructing at Colorado Aero-Tech and working in heavy repair for Evergreen. Over the years he has assisted me with a number of Corvair engine builds and test runs. Even if this was true, I simply ask this: If you were about to take off for your first flight lesson ever, and the person next to you, who you thought was a flight instructor, suddenly confessed that he had never flown a plane, but he “had driven a lot of race cars before”, You would jump out right? OK, you should have the exact same reaction to anyone telling you that he has built a lot of race car engines, but not any flight engines. You would think that this goes without saying, but people still seek the assistance of unemployed car mechanics with their experimental flight engines every day. It’s insanity, but it never stops.-ww.